The Social Leader will be a Storytelling Leader: not simply shaping and sharing their own narratives, but enabling, filtering, and amplifying, the stories that others tell. Specifically, they will understand the systemic nature of the Socially Dynamic Organisation, and the way that the stories we get to hear are only part of a far more complex, distributed, and conflicted, landscape. 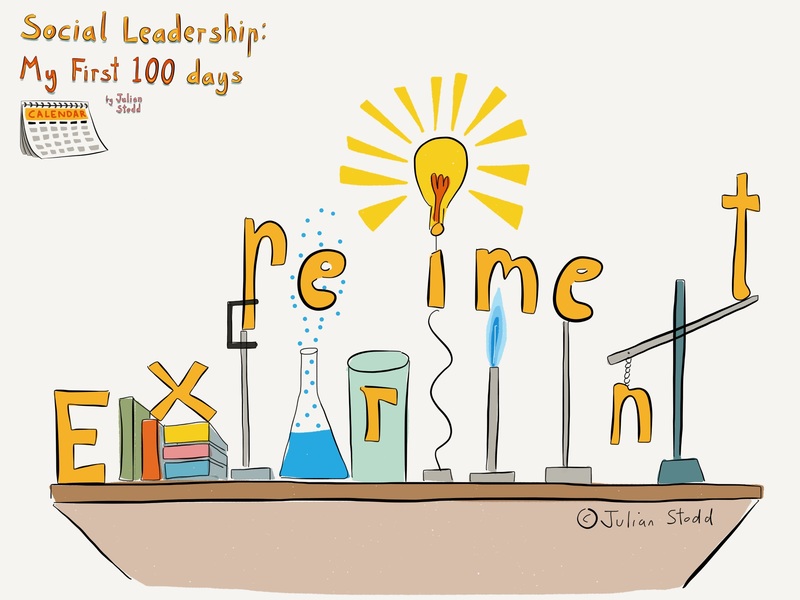 Over the last few months, i’ve been running various groups through a development pathway for ‘Storytelling in Social Leadership’, and trying to share my own learning, both successes, and failures, along the way. Not all of these pieces that i share will be coherent stand alone, but form part of a wider body of work around both the theory of and, more importantly, the practice of, Social Leadership. When i started to design the developmental pieces, i have had a clear focus that they should be rooted in Experimentation: no outside expert will give you the answers you need. You have to find those answers yourself. But to do so, we can provide a scaffolding, a structured space to explore, which is an approach that personified Social Learning. 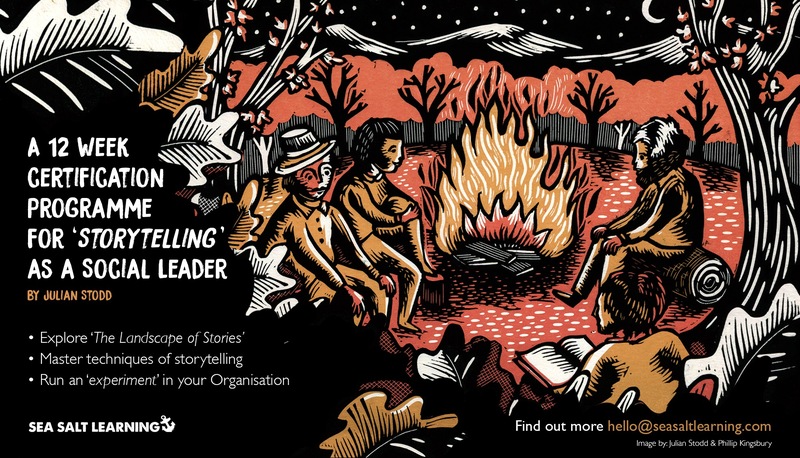 So in that spirit, i’m launching the second module in the ‘Landscape of Stories’ certification today, and it’s focussed entirely on shaping, and running, an experiment around ‘Storytelling in Social Leadership’ within your own Organisation, be it storytelling for ‘change’, for ‘innovation’, or simply as part of your developing ‘leadership’. As part of #WorkingOutLoud, i’m sharing the full six week outline approach here. It’s still pretty rough, as this is a prototype group, but i hope the idea will come across. In this second unit, you will shape and run an experiment within your own Organisation. There is great fluidity in how you shape and run this experiment, and it may relate to the flavour of Storytelling that you wish to pursue [for change, innovation, compassion, coaching, etc]. In earlier work, we considered how stories flow within your Organisation, where they are owned, what power sits behind them, where the spaces are to listen, to respond, to dissent. We have defined the ecosystem of stories as it exists now. But we can look to the future: as a Storytelling Social Leader, how can you understand this ecosystem, better, how can you help it to be better? Which area should you look into in greater detail? Our aim is not to become expert scientists, but rather to design a simple experiment, which we can manage in our own Organisation. We may set out to simply measure something that already exists, or we may seek to influence something by moving one variable. For example, you may seek to increase engagement by changing a rule set on a social platform. Or you may seek to hear more stories by setting up a Cultural Graffiti wall. We will consider how you nullify, or validate, your hypothesis. For example, you may say ‘if we set up a graffiti wall, no senior leaders will participate’, and if they do, your hypothesis is nullified. As well as running the experiment this week, you will write a story of what you have learned about the process of experimentation so far: how did it feel, what have you learned already, and what would you do differently next time? This week is the second week of your experiment: we will mainly work together, within our community, to share results from week 1, and to consider how we can start analysis next week. Now that you have the results of your experiment, you can consider whether they have surprised you, or not! What did you hypothesise, and what do the results show? You will work with your cohort to tease out the meaning from the story the data tell. You will learn to tell a story with data, to share the results. You will also consider recommendations you would make for a follow up study. Our development as leaders is largely a personal narrative: the leader that i am, and the leader that i will become. At the end of this programme on storytelling, you will write and share this story. Your final step in achieving Certification as a Storytelling Social Leader is to submit a report: this will consist of the full Logbook that you have compiled, alongside your story of the Storytelling Leader that you will become. This report forms your formal portfolio, which you will be assessed upon. Alongside this, you will compile, and submit, the view of your community: what is the Social assessment of how you have done. How has your community seen you change? How have your stories achieved effect? We will provide you with some tools that you may wish to use, or you can make your own up, individually, or within your cohort. This entry was posted in Social Leadership, Social Learning, Stories, Storytelling and tagged Experiment, Landscape of Stories, Leadership, Narrative, Social Leadership, Stories, storytelling. Bookmark the permalink.